The key to getting the optimum spark out of your magnetos is timing. First, you need to set up the magneto to produce its spark at the optimal point in the rotation of the magnet. Second, you need to make sure the magnetos breaker points open together. Third, you need to time the magnetos to the engine using one of two different procedures. Up front, I want you to know I am not an A&P. The discussion below is the result of study and questioning those "in the know". Your A&P is best-equipped and trained to make adjustments to your magnetos. My intention is to give you the tools and knowledge to detect potential problems and understand the remedy. This discussion should in no way be considered a replacement for the service manuals available from Teledyne Continental Motors (TMC) for this specific magneto. There are many generic procedures in the TCM manuals that will not be repeated here. Get the manuals. They are inexpensive and well worth the investment. Look to the end of this article for information on obtaining your own copy of the TCM manual. Most people will agree that having the right tool for the job is the best way to go. 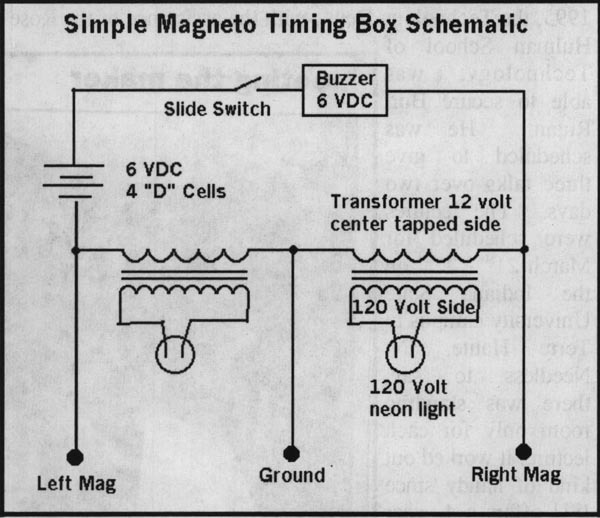 The right tool for timing a magneto is a Magneto Timing Box or "Buzz Box". Accurately evaluating your magneto without this tool is almost impossible. You can easily build a Magneto Timing Box for about $30.00 using mostly all Radio Shack parts. A schematic and parts list appears at the end of this article. There are several things to keep in mind when you handle magnetos. 1) Magnetos are designed to run in either a clockwise (CW) or counterclockwise (CCW) direction when you look at the magneto from the end that interfaces with the engine. The D4RN-3000 is a clockwise rotating magneto. You can see a clockwise pointing arrow stamped on the impulse coupler housing that mates with the engine. When you view the magneto from the aft or ignition harness end and look at the rotation, you will notice that the rotation is counterclockwise from this perspective. This can be very confusing, so the best way to think of it is "in the direction of rotation." When you look at the magneto from the "front", the direction of rotation is clockwise. When you look at the magneto from the aft end, the direction of rotation is counterclockwise. 2) When you spin the magneto shaft in the direction of rotation, you will engage the impulse coupler. Again, the impulse coupler is a mechanical "trick" designed to delay and spring release the magnet rotor at a speed faster than the crankshaft that it is connected to. If you rotate the magneto shaft opposite to the direction of rotation, the impulse coupler will not engage and no spaik will be produced. You should always rotate the magneto opposite to the direction of rotation, even if the engine is not installed on the engine. You might be thinking, "Off the engine! There's no chance of the engine starting like that!" You are right but you need to consider the inner workings of the magneto and allow some path to ground for any spark you will generate. High voltages in the very thin secondary coil will be on their own to find a ground if you don't provide one. The secondary coil wire will try to create an arc over to the magneto case to dissipate the high voltage generated. If you let it attempt to arc too many times, the thin varnish insulation on the thin secondary wire will degrade and lead to shorting or a broken wire. Either of these conditions could result in poor spark or no spark at all from the affected magneto. 3) "Cleanliness is next to Sparkiness". Keep the inside of the magneto clean and clear of any dust or other particles. 4) The capacitors should be checked to make sure they can maintain their designated charge. Capacitors that cannot maintain their charge are referred to as being "leaky" and should be replaced if they exceed the specific range specified in the TCM manual. The front impulse coupler side of the magneto is held together to the aft ignition harness side of the case by four alien head screws on the aft corners. After you remove the four screws, be careful not to yank the harness half of the case off the magneto. There are two wires connecting the capacitors located in the harness side of the case to the breaker contact points. These wires connect to the contact breakers with a .25" fast-on tab that can easily be pried off with a small screwdriver. Once the left and right wires to the capacitors are disconnected from the contact breakers, the ignition harness half of the case can be removed. The inside of the magneto looks similar to the drawing. There are only five screws that this discussion will cover associated with the cam adjustment and the breaker contact adjustment. One screw is holding the cam in place and is located in the center of the magneto. The other four screws hold down the two breaker contact assemblies. TCM suggests using a wire-type feeler gauge for this task. A blade-type gauge will not fit into the area very well. Rotate the magnet rotor from the impulse coupler end of magneto opposite to the direction of rotation until the white nylon cam followers are both on the rounded high portions of the cam as opposed to the flat low portions of the cam. Check the contact breaker gaps with the .016+-.002 feeler gauge to determine if any adjustment is required. If so, loosen the two screws that hold down the contact assembly and adjust until the correct gap is obtained when the screws are both tightened down. Repeat the process on the other breaker contact assembly until both gaps are set. The cam is the round cylinder shape that sits at the top of the rotor shaft. When you look down on the cam from the screw end, you see that there are two flat areas on either side of the cam. The breakers are closed when the cam followers are against the flat portions of the cam. The cam is pressed on the rotor shaft and held in place by the screw. The rotor shaft is tapered and the inside of the cam is designed to accept the tapered end of the rotor shaft. To loosen the cam, back out the screw several threads but not enough to remove the screw and be sure a couple threads hold the screw in place. Place two large flat blade screwdrivers on opposite sides of the cam and pry the cam up by rotating the screwdrivers and pressing against the bottom of the cam and the housing below the cam. Remove the black plastic access hole covers from the center hole located next to the magneto data plate. Remove the two similar covers from the right and left side of the magneto. You should be able to see large white gears when you remove the side covers. Rotate the shaft of the magneto opposite to the direction of rotation until the red teeth are centered in both sides of the magneto as shown in this image. Please note there is a red dot on the top of the gear. 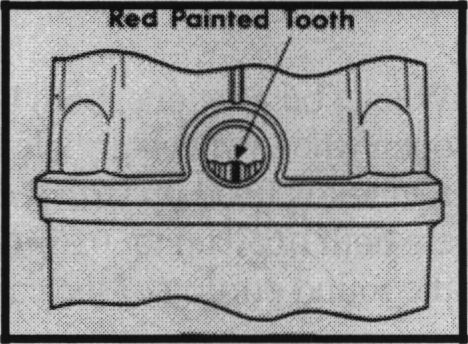 This is used for a different purpose and should not be confused with the red teeth. This brings the magneto near the proper e-gap position for the number one lead on the ignition harness. 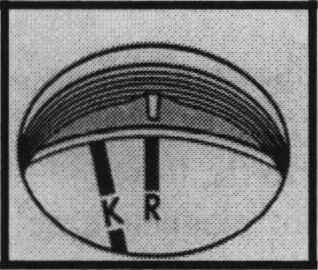 Look into the center hole and then center the marker with the R to the right of the K line on the rotor. That places the rotor in the proper e-gap position for this magneto. It is 8 degrees past the neutral K position. Clamp the rotor at the impulse coupler end to keep the rotor in this position so you can use both hands to complete the rest of the procedure. TMC has a specific tool to do this, but a simple tool can be devised to keep the rotor from moving. The Magneto Timing Box or Buzz box has three wires. The ground wire connects to any portion of the magneto housing such as a bolt hole in the housing. The right wire connects to the top contact breaker .25" fast-on tab on the data plate side of the magneto. The left wire connects to the lower contact breaker .25" fast-on tab. Rotate the cam until the two nylon cam followers are in the low flat sides of the cam. To rotate precisely, you can place the tips of long nose pliers into the two round indentations on the top of the cam. Turn on the Magneto Timing Box and rotate the cam in a counter clockwise direction until the points just begin to open. This will happen when the followers are on the flat surfaces before it reaches the round surface. You can manipulate the cam CW and CCW to determine the precise point when the breaker points begin to open. Remove the clamping mechanism holding the rotor in position and tighten the screw holding the cam to press the tapered areas back together. Rotate the magnet shaft to check that the points still begin to open when the R is lined up next to the K line in the center hole. Slowly rotate the magnet rotor back and forth close to the R line near the K mark on the top of the rotor magnets. Note if there is any difference between the left and right breakers as to when the breaker contacts begin to open. If there is some difference, work with one of the assemblies by loosening the screws that hold it down and moving the assembly until you get a match. Be sure to rotate the rotor until the cam follower is on the round part of the cam for that assembly and make sure you also have the .016+-.002 breaker gap established. Remove the wires from the Magneto Timing Box to prepare for assembly. When you are done, both breaker contacts should begin to open when the center hole shows that the R line beside the K mark is lined up with the indicator and the contact breakers both open up to 016-inch gap when the followers are on the round portion of the cam. Reconnect the wires from the capacitors to the contact breakers. 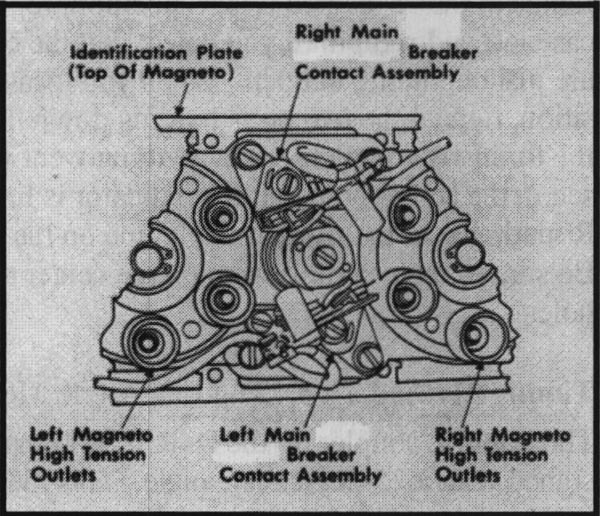 The wire from the right magneto goes to the top contact assembly and the left magneto goes to the lower contact assembly. Place the two halves of the magneto case together and replace the four screws in the corners and tighten. There are two basic ways to time the magneto to the engine. One way requires the use of a Magneto Timing Box and the other does not. Before you place your magneto on your engine, make sure the engine is in the correct position for the timing procedure. Both methods require you to locate and bring your engine to Top Dead Center (TDC) for the compression stroke of cylinder 1 on the aft pilot side of the engine. You can tell the cylinder is in the compression stroke because air will attempt to pass by your finger if you hold it over the hole from the removed spark plug while the lower spark plug is in place. You will also note that the two push rods to the number 1 cylinder will not be compressing either valve. TDC is the highest point in the linier motion of the piston as it moves toward the head. There should be a mark on the prop flange relative to the center split line on the crankcase that should indicates this TDC position. Verify the mark if there is one. Some have been reported to be off by a substantial amount, which could happen if the prop flange has been removed and repositioned. Once the proper TDC for number 1 cylinder has been established, rotate the prop flange opposite to the direction of normal rotation until the center of the case lines up with the 25-degree Before Top Dead Center (BTDC) mark. This is the point in the rotation that the spark will fire for this cylinder. If the red teeth in the two sides of the magneto are not centered from your previous steps, rotate the rotor shaft opposite to the direction of rotation until the red teeth appear near the center of both side windows. Insert the drive end of the magneto into the end of the crankshaft and insert the clips and bolts to retain the magneto. Note, many people replace the alien head bolts that hold the magneto clips in with a similarly sized hex head bolt to make it easier to adjust later when on the aircraft due to the tight arrangement on the firewall. Do not tighten the bolts down yet. Just make them snug so you can test your positioning. Connect the ground wire to the magneto case somewhere and connect the left and right wires to their respective p-lead wires. Turn on the Magneto Timing Box. With the prop flange at the 25-degree BTDC position, rotate the magneto case left and right until you detect that the contact breakers are just beginning to open. When you locate the proper position, tighten the two bolts holding down the magneto and the timing is complete. If everything went well, you should see in the center hole that the indicator is lined up with the R mark just to the right of the K line on the top of the rotor. Be sure to replace the covers on the center and side timing holes. improve the starting process and reduce kickback. Since this internal delay is the same number of degrees as the normal BTDC angle, the spark event during the startup procedure will be at or near TDC and revert back to the 25-degree BTDC after the impulse coupler becomes inactive. Slowly rotate the prop flange in the opposite direction to the normal rotation beyond the 25-degree BTDC another 10 to 20 degrees until a clack is heard in the magneto. That sound is the impulse coupler getting ready to go into action. It is extremely important before you do the next step that you locate the top and bottom spark plug wires for cylinder number 1 and hold them so the springs at the end of the two plug wires are within . 125" of a ground that is connected to the magneto. Only hold the ignition wire by the plastic coating and do not touch any of the metal on the ignition harness or you will become part of the spark event your magneto will be producing! Slowly rotate the prop flange in the normal direction of rotation this time until you are about 10 degrees from TDC. Slowly bump the prop flange in the normal direction of rotation until the spaik occurs. Take note of where the center-line of the case is relative to the TDC mark on the prop flange when you get the spark to occur. Using this method, the spark should occur at TDC so rotate the magneto left and right repeating the entire procedure after each change in position until the spark occurs at TDC. Tighten the magneto down when done and the magneto is timed to the engine. Be sure to replace the covers on the center and side timing holes. Magneto Manual $15.00 2 lbs. Service BulletinsSet $10.00 2 lbs. The shipping for 1-5 lbs is $6.75 for domestic deliveries using UPS. Click on the "Get a copy of your Technical Publications order form." link to view the entire list of available publications. Hopefully, you now have a better understanding of how to apply the information in the TCM manual for this magneto and possibly perform the timing procedures yourself. At the very least, you should now be able to determine if your A&P correctly timed your magnetos.